Today I’m writing about history, not textile history, but human evolutionary history. Every once in a while, you meet someone truly by chance. Last fall we were visiting friends in Asheville, NC. Visiting, and, of course, shopping in Historic Biltmore Village. One of our favorite type of retail stores is a nature-related shop. We like hunting out the squirrel-proof bird feeders, and trying on those vests with all the pockets. We don’t have a use for the feeders where we live now, but when we lived back east those squirrels drove us crazy, so I guess we are drawn to them by habit. 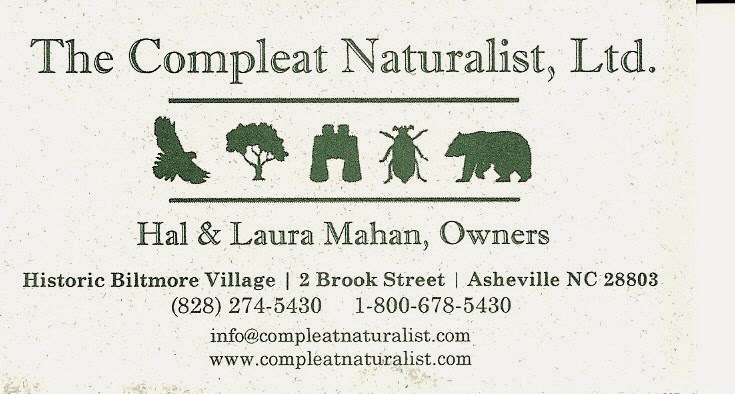 We happened into a lovely shop, The Compleat Naturalist, Ltd. While browsing the book selection (we don’t need to frustrate hungry squirrels, but I never met a book which could not add to my intellectual curiosity) an elderly gentleman approached us. I assumed he was a service clerk, but as it turned out he was the owner, Hal Mahan. He asked if I knew about “Lucy”. As we were looking in the anthropology section, I knew he meant Lucy, one of the earliest hominids discovered, as it happened, 40 years ago. Mr. Mahan and his wife, Laura, had retired to Asheville but he could not retire from his love of natural science. His academic studies were at Michigan State University with a master’s and doctorate degree in zoology. In the 1960’s Mahan, while working at Central Michigan University, established a museum training program for graduate students who had difficulty finding jobs in academia. He later became director of the Cleveland Museum of Natural History. Eight of these post-graduate students eventually became directors of museums. It was one of his protégés that brings us to Lucy. Mahan was to meet with Richard Leakey, the director of the Kenya Natural Museum in Nairobi who told of his expeditions and of his interest in Mahan’s training program. Don Johansen was recommended to Leakey and soon he was part of a field expedition in Hadar, Ethiopia. He was soon to telegraph Mahan ( who was doing field work in a neighboring African country) of his discovery. Lucy was found nearly 44% complete, rather than the odd tooth or bit of bone and came to live at the Cleveland Museum for study. 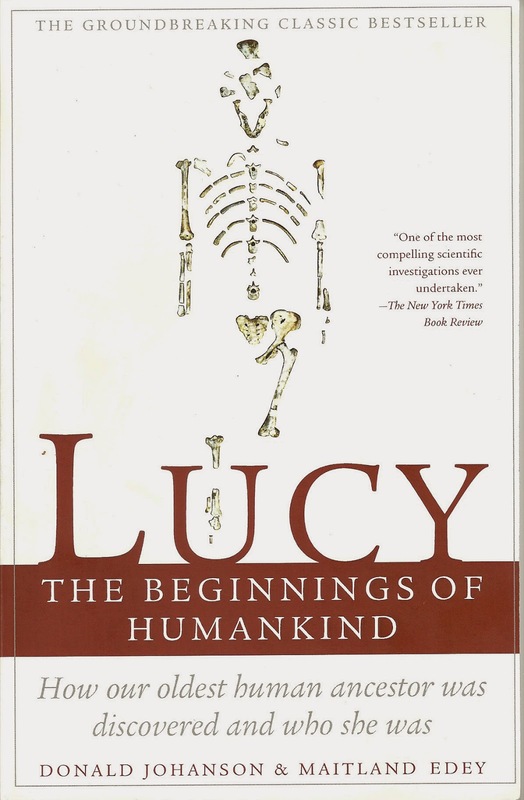 Lucy: The Beginnings of Humankind, written by Johansen and Maitland Edey is the story of the discovery and final accreditation of Australopithecus afarensis, nicknamed Lucy. Usually, these anthropologic tales are a bit too scientific for the non-paleontologist (like me). But this is a very well written volume that begins with the earliest finds in the 18th and 19th C and the controversies that seem to follow every scientific discovery. I am now immersed in the reading of Lucy, thanks to a chance meeting with one of the most interesting persons I have encountered in quite a while. Most visitors miss some of the most beautiful South Pacific islands of paradise for the simple reason that they are in the middle of a vast sea and, frankly, are not well known. 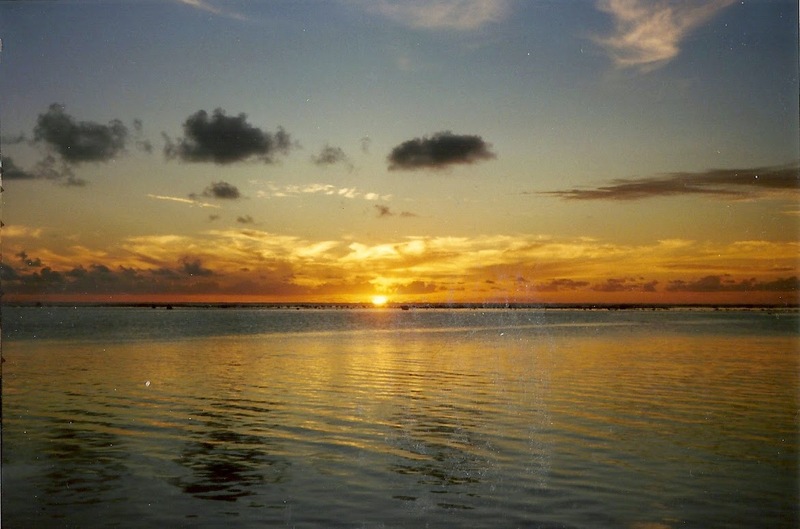 One lovely island nation is the Cook Islands. 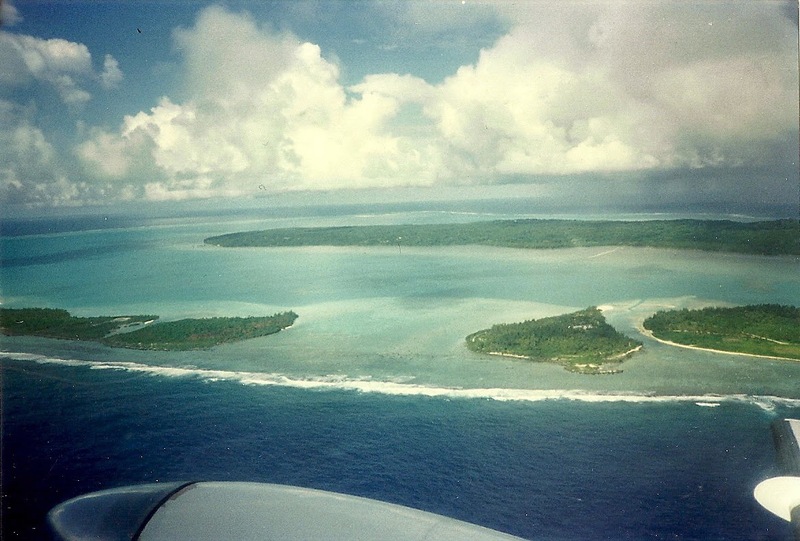 The “Cooks” are comprised of 15 islands with a total land area of a little over 90sq.miles, however their geographical boundaries are nearly 700,000 sq. miles of Pacific Ocean. They have a parliamentary form of democratic government and have a unique relationship with New Zealand as a “free, associated state”, in that N.Z. has responsibility for their external affairs. 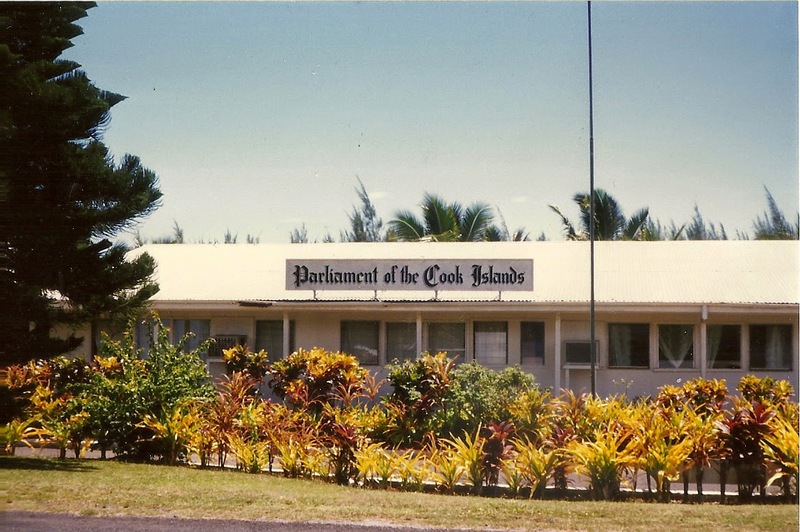 Cook Islanders are also New Zealand citizens, although the reverse is not true. The capital is Rarotonga, but our final destination was Aitutaki, which is reported to have “the most beautiful lagoon in the world”, according to tourist information. 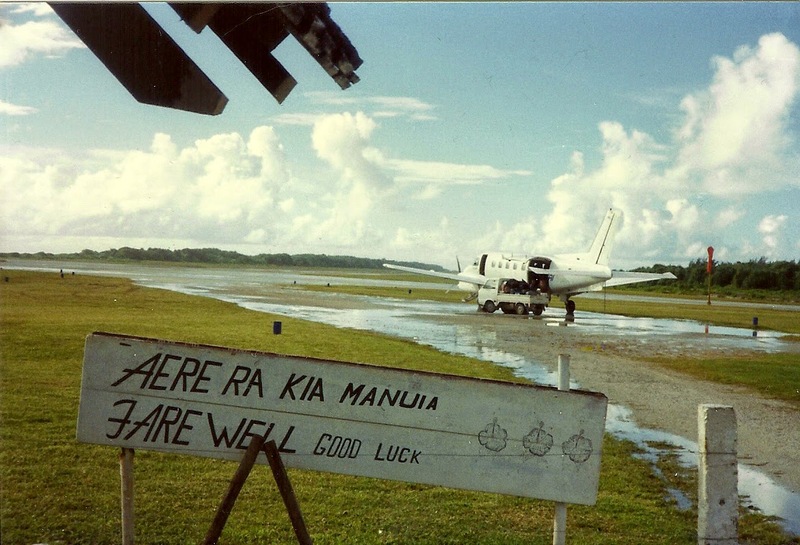 Our reason for this short air flight (in the smallest plane I have even flown), was a meeting with a ham radio operator and a meeting with textile artists, Mrs. RuRu Carl and Mrs. Tara Thomas, who worked with the island’s tivaevae makers. Guess whom I was meeting. 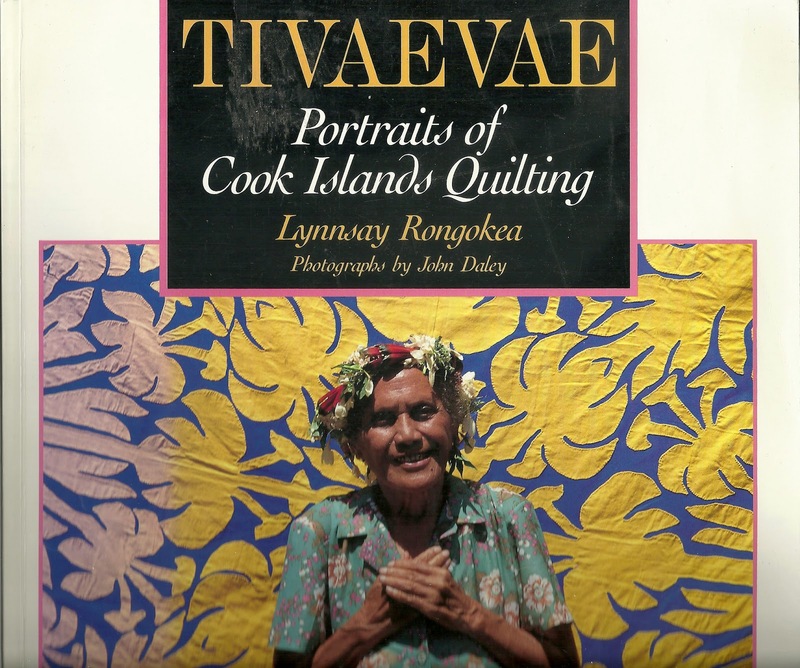 At first glance, Tivaevae, is a version of Hawaiian quilts (also sometimes mistaken for Tahitian”Tifaifai”). Their resemblance is understandable. 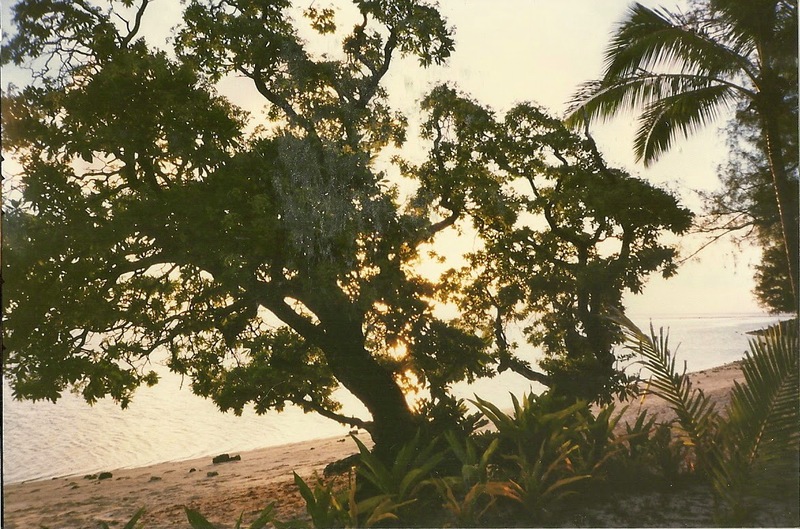 Although the islands are thousands of miles apart, missionaries and their families traveled throughout Polynesia. 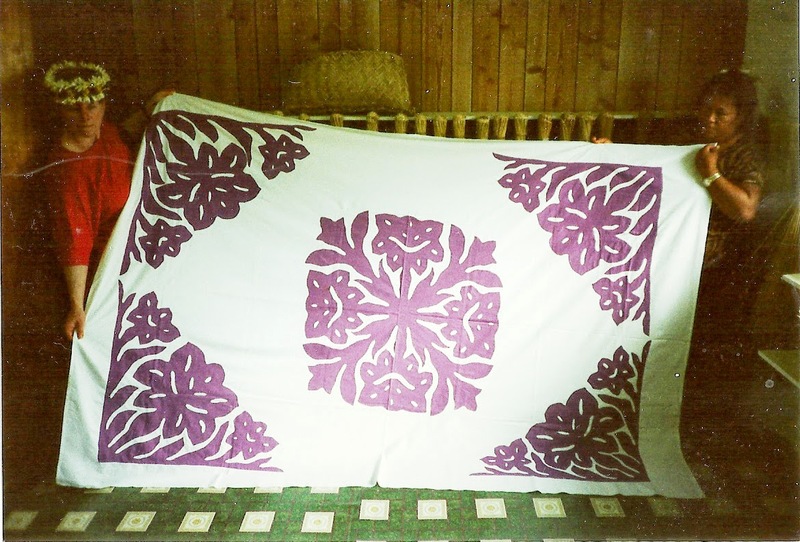 The missionary wives taught native women sewing and embroidery techniques, including the making of bed coverings. While all variations are based upon appliqué of common native plant life motifs onto a ground fabric, which is then sewn onto a backing fabric, there are differences. 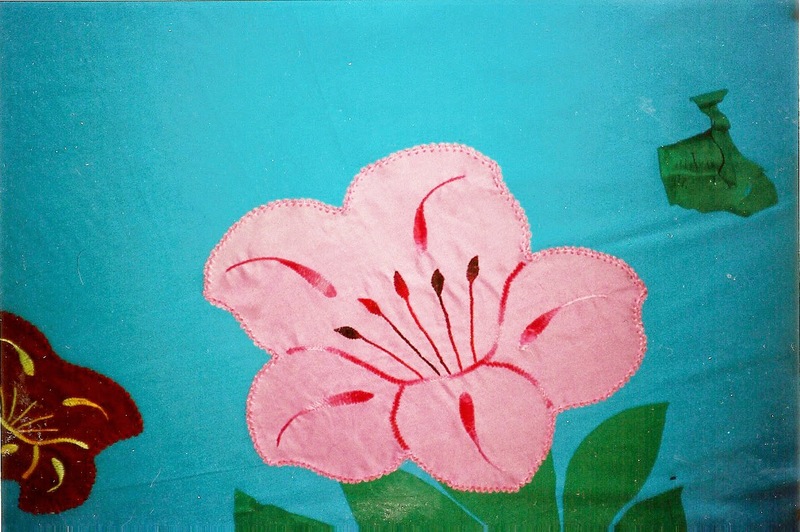 The most outstanding difference is that Hawaiian quilts are quilts in the sense that they have 3 layers: the patterned front, the plain backing and an inner layer of some type of batting. These are heavily quilted using very small stitches to create parallel quilt lines, which follow the appliqué pattern. ( believe me, there is no snow to be found). 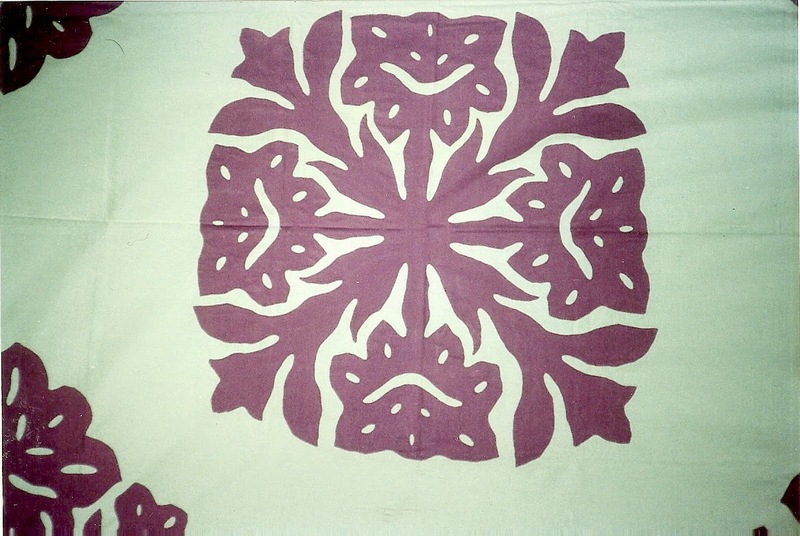 These appliquéd spreads are called” Tivaevae manu”.using only one color for the pattern. “Tivaevae taorei” are pieced spreads made from small pieces of four or more colored fabrics forming triangles, squares or diamond patterns. 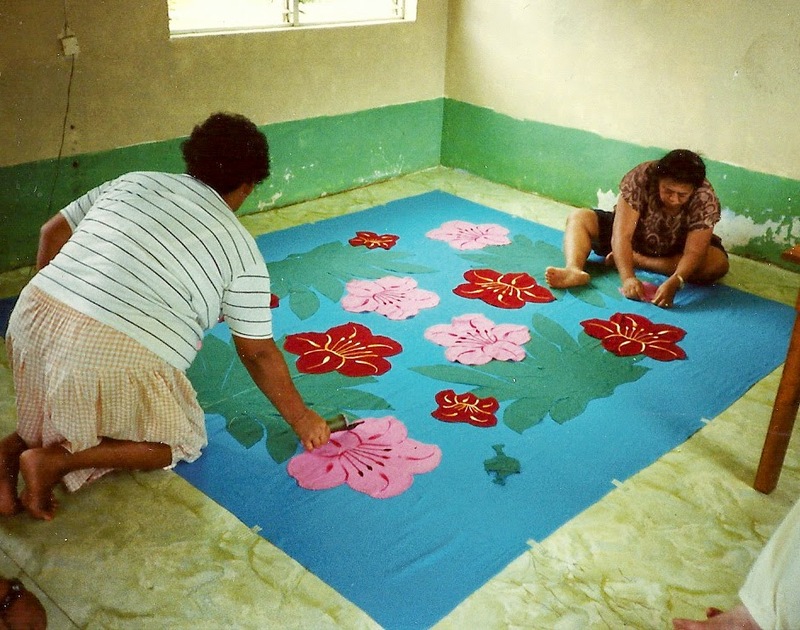 This is intricate work, as each member of the sewing group (vainentini) works on her own square. Therefore, each square must be counted and sewn correctly if the sections are to fit and form the overall pattern. “Tivaevae tataura” patterns are cut out and embroidered before being sewn onto the ground fabric, although it may be appliquéd and then embroidered with 2 strands of pearl cotton, often variegated.. Embroidery stitches may include feather, chain and stem stitches, as well as variations of other embroidery stitches. Each floral motif takes one artist up to one day to create. 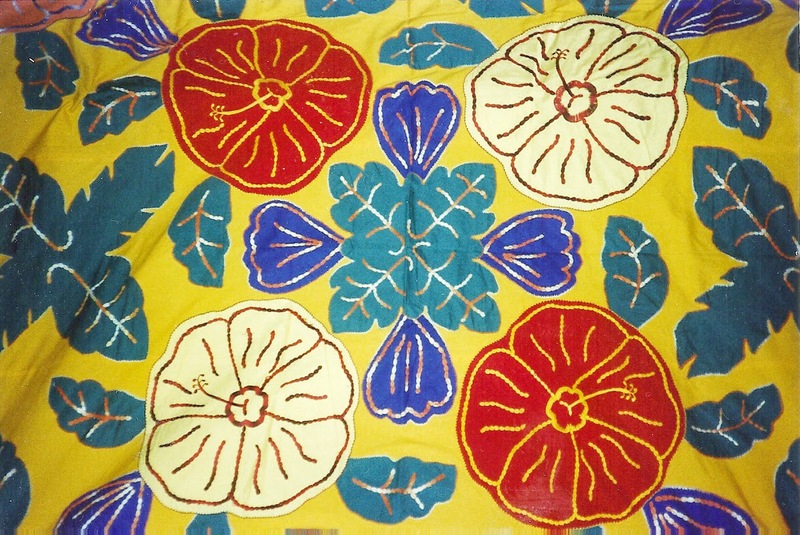 A variation of “Tivaevae tataura” is “tuitui”, in which motifs are sewn onto ground fabric squares, The squares are then crocheted together before being sewn onto the backing fabric. Recently I received correspondence from Christine Lundberg, an independent film producer. 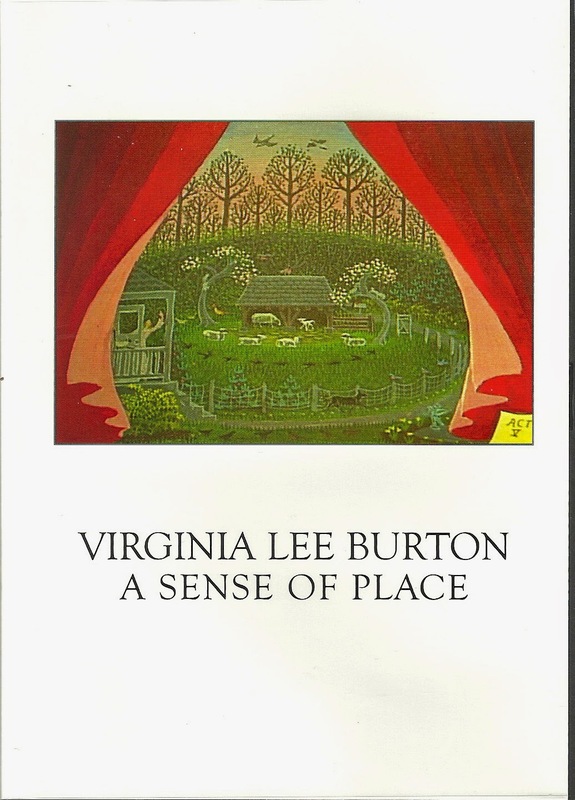 Christine has produced a documentary on Virginia Lee Burton, her life and career, Virginia Lee Burton: A Sense of Place. Virginia (Jennie) Lee Burton is well known as an author and illustrator of children’s books. In fact, she was one of the first to use high quality artist techniques to illustrate her stories, which have been read and loved by generations of children and their parents. Virginia was also the founder of a group of artists, Folley Cove Designers who produced the most incredibly designed textiles ( and later other products featuring their designs). Now, Christine is preparing to produce another film, this time on the Folley Cove artists and the history of their cooperative. If any readers have relevant information regarding Folley Cove and the artists perhaps you could communicate with Christine. I am sure she would be most interested in your contributions and comments on the subject. "A Celebration of American Quilts"
“A Celebration of American Quilts” is a small exhibition accompanied by a very large reference volume, “Four Centuries of Quilts”. The DeWitt Wallace Art Museum, one of the Art Museums of Colonial Williamsburg, is showing only a small number of quilts from their large collection (12 quilts). The real gem is not the exhibit, however, but the large reference volume written by curators Linda Baumgarten and Kimberly Smith Ivey, with 356 pages and over 300 color illustrations. The history of quilting fabrics is a long one. Early warriors and fire fighters wore garments of heavily quilted cotton and other fibers for protection. Quilted cloth was a protection from the elements and was also used as padding. 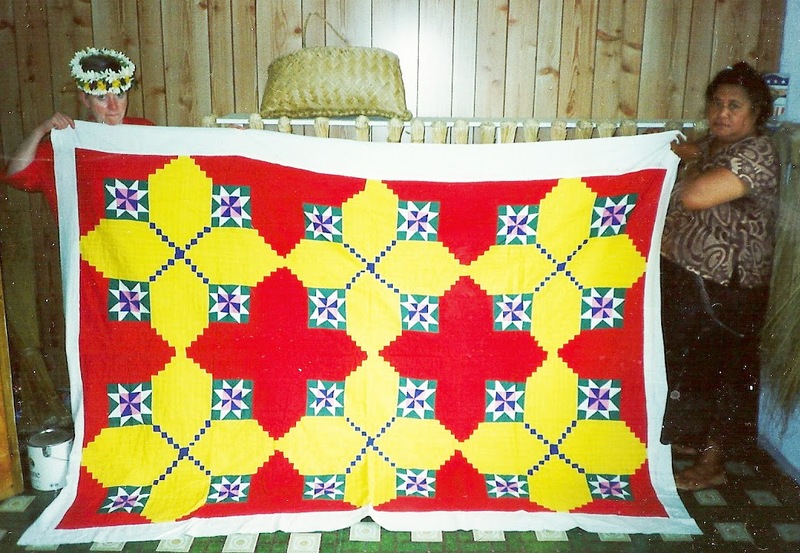 Quilts, as bedcovers, did not originated in the US, although quilting has been extremely popular in this country. Fabrics introduced into Europe from the east were made into bedcoverings as well as whole cloth quilts of wool and other local materials. These, then, were introduced into the newly populated US in the 17th and 18th centuries. Once valued only for their utilitarian purposes, quilts today are regarded as artistic expressions. The skill of the makers in creating images of color and pattern is not the entire process, however. The real story lies in the history, thoughts and emotions sewn into the textiles by their makers. There are many folk tales about magic and supernatural powers attributed to textiles, especially bedcovers, which protect against cold but also evils that might befall those at rest. These stories about the quilt makers are unfortunately often lost, as many of these textile works of art were neither dated nor signed. 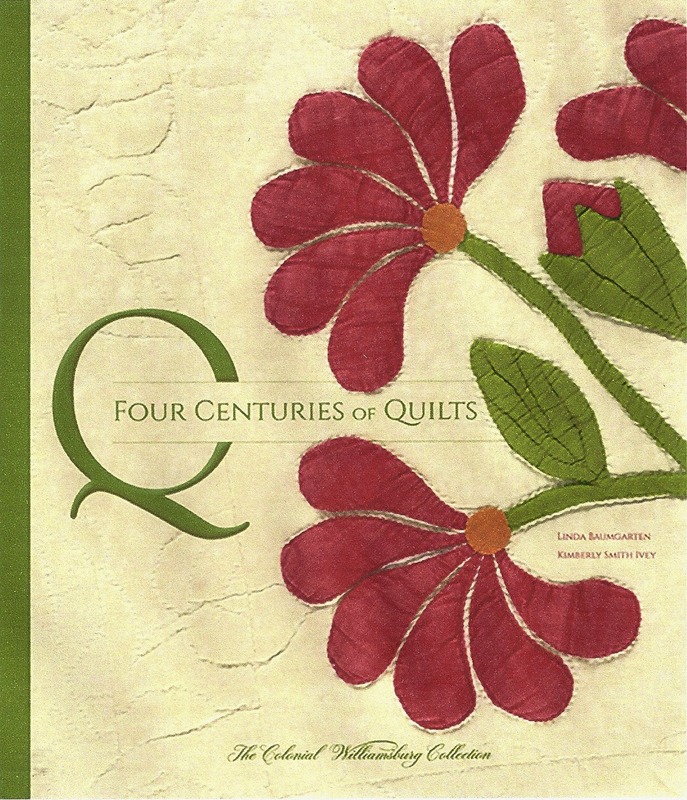 “Four Centuries of Quilts” catalogs the museum’s collection of nearly 180 quilts and the authors have attempted to relate the stories of the quiltmakers, bringing their efforts into our world today. Linda Baumgarten is the curator of textiles and costume. She is also the author of “What Clothes Reveal”. Kimberly Smith Ivey is the curator of textiles and historic interiors.